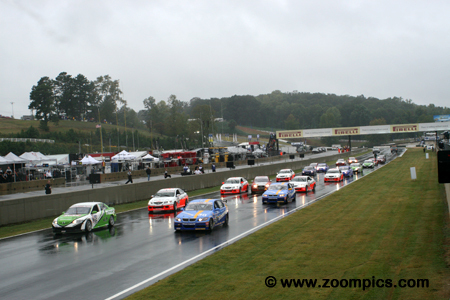 There were twenty World Challenge Touring Car starters for the 2007 season’s penultimate round at Road Atlanta. 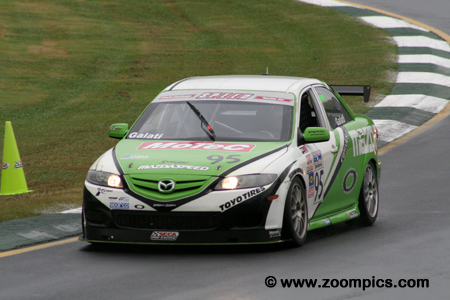 On the pole is the Mazda 6 of Michael Galati. Next to Galati on the front row was Seth Thomas in the No. 38 BimmerWorld BMW 325i. Behind Galati is the first RealTime Racing entry of team principal, Peter Cunningham. Beside Cunningham is Thomas’ teammate, James Clay in another BMW 325i. Qualifying on the pole in the No. 95 Mazda North America / Tindol Motorsports Mazda 6 was Michael Galati. At the start of the race, second fastest starter, Seth Thomas reached turn one first. Galati followed Thomas until lap-15 when he got a good run and passed the BMW before the first corner. Galati led the remainder of the contest and won his first race of the season. His win secured the Touring Car Manufacturers’ title for Mazda. Adam Pecorari was the star of the race. After qualifying, Pecorari did not appear to be much of a threat as he started nineteenth. During the race, he charged through the field and with four laps remaining in the contest he was on the tail of race leader, Michael Galati. At the finish, Pecorari was second and earned the Sunoco Hard Charger Award for advancing seventeen positions during the event. This result gave him the 2007 Touring Car title. Starting fourth on the grid was an injured, James Clay. Clay was recovering from a dislocated shoulder but that did not appear to slow him down. 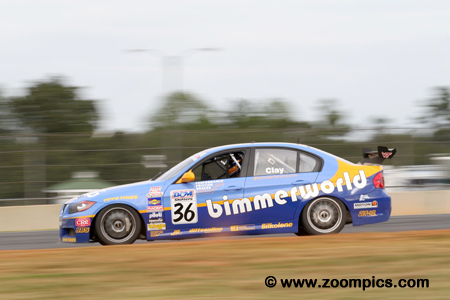 The driver of the BimmerWorld BMW 325i settled into sixth place early in the race. An incident involving his teammate Seth Thomas and RealTime drivers Peter Cunningham and Kuno Wittmer elevated him to third which is where Clay finished. This was his best result of the 2007 season. 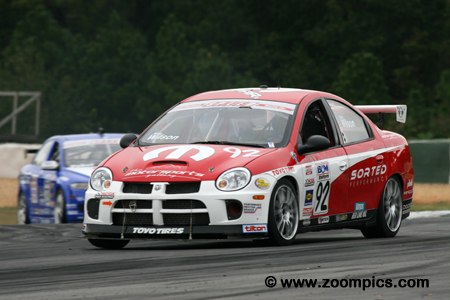 Rookie, Stan Wilson qualified sixteenth driving the Sort Performance sponsored Dodge SRT-4. Wilson made good progress during the race – advancing ten positions and was sixth at the checkered flag. This was his best result of the 2007 season. Wilson was awarded the Piloti Rookie of the Race. It was proving to be a difficult season for the defending Touring Car champion, Pierre Kleinubing. 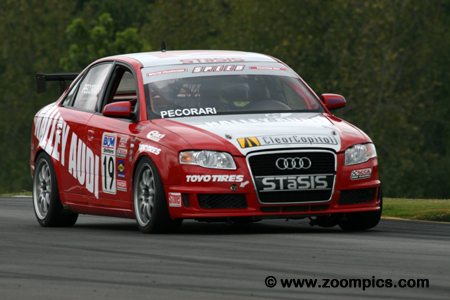 Kleinubing set the fastest race lap at the first two events of the season and qualified on the pole at Lime Rock but was yet to win a race in 2007. At Road Atlanta, he was gridded in the fifth starting position. 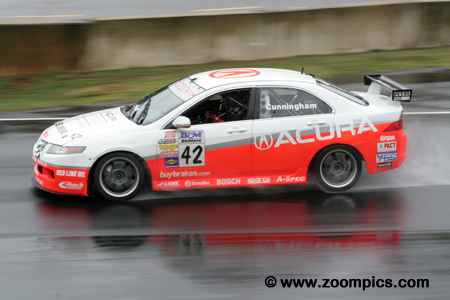 Driving the RealTime Racing prepared Acura TSX he finished fifth. 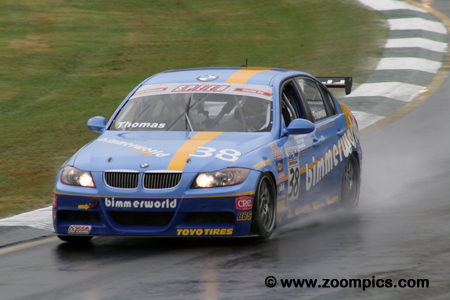 Seth Thomas qualified second – driving the No 38 Bimmer World BMW 325i. Thomas got a great launch and led the race for the first fifteen laps. The contest’s first full-course caution bunched the field and on the re-start - Michael Galati, Peter Cunningham and Kuno Wittmer passed Thomas. Then on lap-16 he made an error in turn ten and collected Cunningham and Ian Baas. Thomas was forced to retire. Earlier in the season, at Toronto, Peter Cunningham ended a twenty-five race winless streak. Cunningham started from the third grid position and trailed the race leaders Seth Thomas and Michael Galati for the first ten laps. On the contest’s first restart, he and Kuno Wittmer passed Thomas. 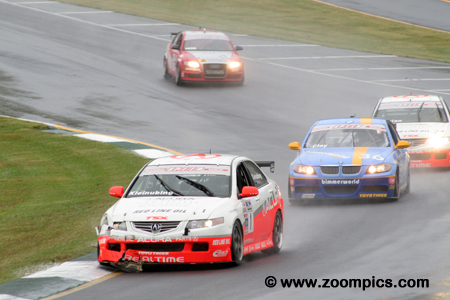 Unfortunately, Thomas lost control in corner ten and collected Cunningham and Ian Baas. The damaged Acura was unable to continue. Chip Herr’s season had been up and down – he had runner-up finishes at Mosport and Mid-Ohio and a victory at Lime Rock but his other results were not as spectacular. Driving the No. 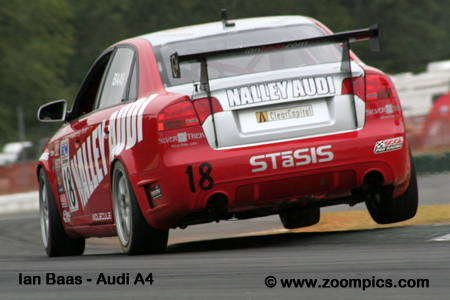 17 STaSIS prepared Audi A4, Herr qualified fifteenth. 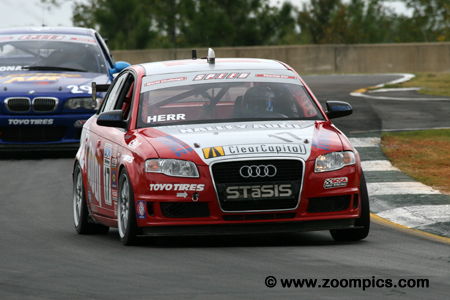 At the start, he put Audi’s all-wheel-drive to good use and passed six cars before the end of the first lap. This performance earned Herr the B&M Holeshot Award. 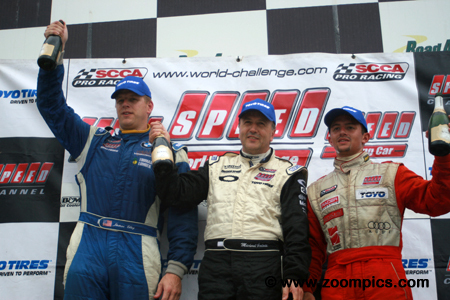 The World Challenge Touring Car podium at Road Atlanta. On the left is third place finisher, James Clay and to the right-side is runner-up, Adam Pecorari. Between these two is the race winner, Michael Galati. For each of the drivers on the rostrum, this was their best result of the 2007 season.